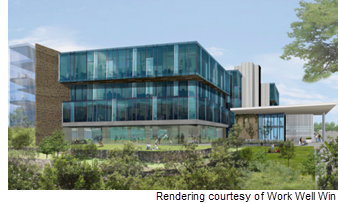 ​​ AUSTIN – A new coworking space with a wellness approach, Work Well Win, plans to open a 100,000-sf site at the former Motorola campus. To be situated at 3501 Ed Bluestein Blvd., the design of its workspace will focus on wellness. Some of the amenities include air purification systems, soundproof private offices and phone booths, organic local food, advanced water filtration systems, lots of natural light, ergonomic desks and meditation spaces. The coworking company is also partnering with fitness companies to provide access to classes and workout facilities. The facility is set to open in summer 2018.